My farmer friend Jeremy handed me a white butcher paper-wrapped package of responsibility recently. Meantime, I have the responsibility of doing something with this tongue. There are only so many filets and porterhouses and such on a cow. At some point, noisy whole animal advocates such as me have to face the fact that the tongue is there and must also be treated with respect. Unless you buy a whole cow yourself though, it is possible to pay lip service to the whole animal idea without actually following through. I do use whole chickens and turkeys and love to save bones and all for stock, but hmmm…a beef tongue is a different matter. And I’ll admit that I’ve never cooked with tongue before. I’ve had it pickled at a fancypants restaurant once and it was delicious. My experience with it ends there, I’ll admit. But hey, I’m up for the challenge, so I’ll google and read my meat cookery books and maybe consult a few chef friends and it’ll be great! Truthfully, the real challenge may be a social one – convincing my wife and any other dinner guests that they should eat tongue with me. Wish me luck! Remembering great tongue sandwiches from a deli in Syracuse, where I grew up… good luck, Grant! Btw, are you going to hear Michael Pollan talk at Elmhurst College in April? Cheers! I also grew up in Syracuse and remember tongue sandwiches and sliced tongue by the pound at several Syracuse delis (Meltzer’s, Pickles, Richmans). Went to grad school in Cleveland and a date almost lost it one night. We had dinner at one of Cleveland’s better delis and I ordered a combo sandwich of pastrami, chopped liver and tongue with Russian dressing. My mother used to make sweet and sour tongue. Romanian Kosher Sausage and several Skokie delis sell fresh and pickled tongue. Your name is familiar. Did you attend NHS? I graduated in ’68. 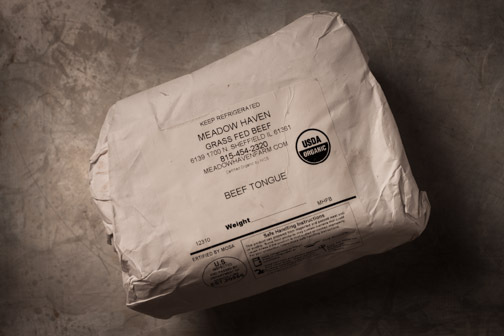 When growing up on the farm, tongue was considered “special” and thus only for the adults. They always made tongue sandwiches. My recall is that it was just boiled and then sliced. yuk! I was always glad it was “special”. I am sure will make something yummy. Maybe so “special” that Carolyn cannot have any. Tongue is delish, has a great texture. I usually just slow braise it with parsnips, carrots and some red wine – just like oxtail or heart. Though my grandmother supposedly made some type of salsa verde with it (though w/o tomatillos, no such thing exists in Austria). Just make sure you peel the tongue! Thanks all for reading and mostly commenting with encouraging remarks! Has me inspired to get cooking soon!